The map shows the positions of all 19 U-Boats and one Italian submarine, the Archimedi, all them sunk in the South Atlantic. In the heavy patrolled waters, Brazilian Navy, British Royal Navy on African side, and US Navy in a joint effort along with hundreds of aircrafts around the clock patrol sweeps gave no truce to the Axis submarines. 906 crewmembers of the U-boats lost their lives and only 168 managed to survive. 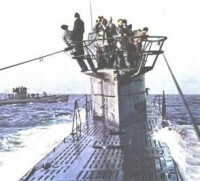 A few subs went to their final plunge with entire crew. Other unfortunate survivors went adrift in mid Atlantic and faced a slow agonizing death by thirst, starvation and exposure. Others survived but died when rescued after long ordeal like Oberbootsman Hans Schade from U - 848 who was adrift for 28 days in the sea and died in Naval hospital at Recife amidst stupor and delirious. Despite the tight grip imposed on them, the U-boats managed to slip into convoys, targetting independents and stragglers and sending to the bottom more than 400 Allied merchants. The numbers speak for themselves. An appalling loss of 8000 lives, 1500 POW's and 27 000 survivors. Four types of U-Boats were in action in the south Atlantic. 79 U-Boats and 9 Italian submarines were sent to that area. Most of them operated isolated in the vast expanses of that ocean, however these tiny boats managed to sink more than 500 merchants of several nations. Their valiant crews fought bravely and despite their astounding initial victories the tide began to turn from 1943 on when the hunters became hunted. The Allies improved their detection apparatus and closed the gap in mid Atlantic. 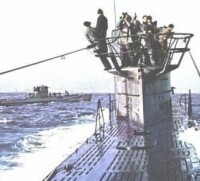 The slaughter the U-Boat crews experienced had no parallel in one specific arm. From 40000 sent into the fray 30000 did not return to their docks and plunged, entombed in their tiny cramped crafts thousand of fathoms below. In the middle of the majestic sea which separates South America and Africa, German U-boats keep a secret rendez-vous. With the supplies exhausted after weeks preying on allied shipping, the U-boat makes contact with a supply submarine, a milk cow, and then during this short moment both crews chat about the war, their mission, take on fuel, food and ammunition. Suddenly the silence is broken by a roar of an enemy aircraft on patrol. Alarm!!! In seconds both crafts crash dive leaving on the surface a suspect swirl. The South Atlantic was a battleground.